Mick McCarthy is back in the job he left almost 6,000 days ago. 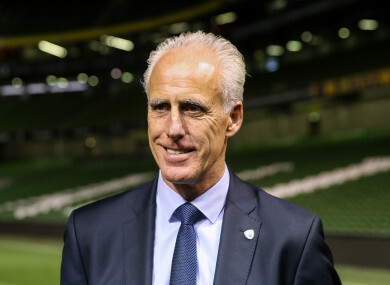 5,966 DAYS ON from resigning as the Republic of Ireland manager, Mick McCarthy will at noon today carry out the first significant duty of his second spell in charge by naming his squad for the Euro 2020 qualifiers against Gibraltar and Georgia. Back in November 2002, McCarthy – being the remaining figure of the nation’s Saipan Cleft – was harangued and booed as his side lost their opening two Euro 2004 qualifiers, and took his leave saying that the negativity around his position had affected performances. While elements of the Irish media were still entangled with Saipan, the English media backed the departing manager. Given that Ireland haven’t won a competitive game since 2017 and scored four goals in the whole of last year, McCarthy shouldn’t have to worry about similar notions this time around. The dilution of quality available to McCarthy since he was last in the job is stark. For instance, of the 17 players he used in his final two games in charge, all but two (Colin Healy and Matt Holland) played in the Premier League. Of the 36 players named in Martin O’Neill’s final provisional squad last November, only 13 were attached to top-flight clubs and one of them, goalkeeper Caoimhin Kelleher, has yet to make a competitive first-team appearance for Liverpool. In a harbinger of what was to become McCarthy’s permanent reality, Declan Rice had absented himself. Hence why the new manager has spent the last couple of months on a recruitment drive, but it is unlikely that any of the targeted players will be in today’s squad. There are various reasons: Will Keane is interested but injured; Patrick Bamford is interested enough to meet with McCarthy but has yet to do so; Nathan Redmond is yet to even go that far. Willem II’s Dan Crowley, meanwhile, may find himself on the outside until McCarthy has the chance to scout him at the Dutch Cup final against Ajax on 5 May. Therefore, the squad will have a distinctly similar feel to it. Expect the Premier League players eligible for the squad to make the cut, although there are doubts surrounding James McCarthy. While he has returned to fitness after a broken leg, McCarthy has yet to make a first-team appearance for Everton this season despite making the bench on five different occasions. The Irish camp had hoped McCarthy would go on loan in January, even to the Championship, and that he didn’t may count against him later today. Elsewhere, Keiren Westwood’s return to form for Sheffield Wednesday – he has kept eight clean sheets in his last 13 games – should bring him back into the picture and provide competition for Darren Randolph, while the defensive selection will be broadly similar to O’Neill’s. The biggest questions on this front will be posed when it comes time to winnow the squad to a starting team: McCarthy has hinted that it may be an either/or selection call between Seamus Coleman and Matt Doherty, and while McCarthy actually signed the latter as a left-back, he has also been impressed with Sheffield United’s Enda Stevens in that position. In midfield, Alan Judge – who has flitted about the edges of recent squads – is playing regular football with Ipswich and will likely be included, while Preston’s Alan Browne has caught the manager’s eye, too. Otherwise, that portion of the squad sheet will be populated with familiar faces: McClean, Brady, Hendrick, Hourihane, O’Dowda among them. The freshest faces will be found among the strikers, but even this is relative: Daryl Murphy may do a u-turn on his retirement, while David McGoldrick will return having been ostracised toward the end of O’Neill’s reign. Sean Maguire will be included having impressed McCarthy of late, and James Collins, who is in-form albeit at League One level with Luton Town, is being considered for what would be his first senior call-up. It’s unlikely that any League of Ireland players will make the cut, although Saint Pat’s Jamie Lennon and Cork’s Daire O’Connor impressed McCarthy at Richmond Park on the opening night of the season. The squad McCarthy names at noon today will assemble for the FAI Awards on St Patrick’s Day, at which they will be forced to look back on a wretched 2018. McCarthy will be among the minority of those uninvolved in those sorry months, and his brief is to ensure that next year’s occasion is an altogether happier one. Email “Expect little upheaval as Mick McCarthy names the first Irish squad of his second spell in charge”. Feedback on “Expect little upheaval as Mick McCarthy names the first Irish squad of his second spell in charge”.